In few other areas of law do the parties to a lawsuit share as intimate a knowledge of each other as do those in a divorce case. In addition, in few other areas of law will the parties have an ongoing relationship with each other after the lawsuit is completed. In a car accident case, for example, it is highly unlikely that the parties will have known each other before the case or see each other after. In a collection action, they certainly will not have a future relationship. Yet in divorce, the parties have had the most intimate contact possible prior to the lawsuit and, if there are children — regardless of whether the children are minors or adults— the parties will have a future relationship. As a result, the process of a divorce case tends to be different from that of other cases. Two people who once were (and maybe still are) deeply in love often can grow to hate each other with passion. It is easy for this passion to lead to litigation, and the conduct displayed during the lawsuit may affect the parties’ relationship for many years to come. Negotiating a divorce settlement can be compared to labor negotiations. Several years ago, I was explaining my theory of the importance of a negotiated settlement to a client when he reminded me that he negotiated with unions for his company. In these talks, the unions want maximum benefits for their members, but they know the company needs to remain solvent. The company wants to pay as little possible, but they don’t want employees leaving or becoming disenchanted. Both sides need to keep in mind that their negotiations are neither the beginning nor the end of their relationship and that if negotiations break down, a strike occurs – and everyone loses. While a settlement of a dispute is certainly no guarantee that the future relationship of the parties will be amicable, a contested trial (or a strike)is guaranteed to be detrimental. Things are said that cannot be unsaid. The ultimate result is likely to be generally unsatisfactory to both parties. The end of the trial (or strike) is akin to the final round of a 15-round boxing contest, with both parties exhausted and hanging on for dear life. The difference between a settlement and a contest generally boils down to one simple precept: Neither party will get everything he or she wants. Both parties have a “wish list”, but they must prioritize their list. In a settlement, each party can negotiate for what is higher on their list, giving up the lower- priority items. Conversely, in a contested trial, the court decides which items on the list the party does or does not get. The court may, either intentionally or unintentionally, award the client the lower-priority items instead of the higher-priority items. In a perfect settlement, both parties get the high-priority items on their lists. Frequently, in a contested trial, neither does. Fortunately, the vast majority of divorce cases, perhaps as high as 90 percent, eventually settle. Unfortunately, the vast majority of family law CLE programs and publications, perhaps as a high as 90 percent, seem to be devoted to litigation. Thus, approximately 90 percent of CLE and publications are devoted to approximately 10 percent of what divorce lawyers actually do. The parties in a divorce case may be used to dealing with each other by yelling and screaming. But the lawyer should not posture in front of the client and should tell the client that he or she will not posture. 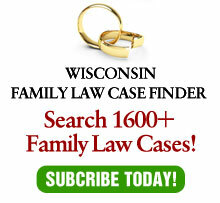 While this is obvious to most seasoned family law attorneys, it is not so obvious to the client. Ever been asked by a client: “Are you really on my side?” Without an explanation, many clients expect lawyers to posture as opposed to being friendly. The method which gets the client to understand the importance of cordiality depends, of course on the personality of each lawyer and on each individual client. What is important is that the lawyer explain the strategy to the client at the outset, so that the client understands that the lawyer’s cordiality is not disloyalty to the client, but an effective means of settlement. Certainly, some issues are more important than others. There may even be issues that are non-negotiable. But stating an issue in the form of an ultimatum stops the negotiating process in its tracks. My client was going to accept your proposal on Friday when she noticed that it was 5:10 p.m. Ask yourself: Are you more likely to settle a case where the other side has given you everything you need voluntarily, freely and openly or where they stone-wall discovery? The answer is obvious. When the other side treats financial information as if it were a highly classified government secret, settlement is less likely. This tactic raises the question “What are they trying to hide?” This sort of mistrust is not conducive to settlement. Here is a strategy that my office has used with great success in promoting settlement: When you represent the side with all the information, give it to the other side before they ask for it. After all, you know what they will need to settle the case. Tell the other side that you are voluntarily providing the information to promote an atmosphere for settlement and to save costs for both parties. Explain that the information is not exclusive and that your client will be pleased to also provide any additional relevant information that you might have inadvertently omitted. Some lawyers seem to have a fear that taking the first step toward settlement is a sign of weakness. As result, some cases sit and wait, even though a settlement conference could begin the process of resolution. According to lawyer Mark Sullivan in his chapter of The Joy of Settlement (ABA Family Law Section; www.abanet.org/family/pubs/joy.html), in settlement, timing is everything. To miss the timing because of fear of appearing weak does one’s client no good. To put it another way, someone has to take the first step, or no case will ever be settled. Viewing this first step as a sign of weakness is an indication of insecurity on the part of the lawyer. Taking the first step can be a sign of strength: The lawyer is so confident in his or her case, that she assumes the other side will want to settle, to avoid the embarrassment of the eventual defeat in court. Backwards negotiating is what occurs when subsequent offers are further away from settlement than previous offers. For example, if the initial offer by a payee for maintenance is for ten years of payments, the next offer should not be for 12 years. Rather, it should be for fewer than 10 years, assuming all other provisions in the offer stay the same. There are times when facts change that may alter settlement positions. However, assuming discovery was conducted before settlement (as it should be), once a proposal is made, subsequent proposals should be closer to the other side’s position, not further away. Backwards negotiating is not good faith negotiating, as it seeks to punish the other side for rejecting a previous offer. The response of a party who receives a backwards offer should be to stop negotiating. If a proposal is made in good faith, then the rug should not be pulled out from under it. Much of what is happening in a divorce, of course, is personal between the parties. It should never be personal between the lawyers, no matter how sensitive or important the issues. Usually, this is not a problem. The vast majority of the lawyers I deal with are pleasant, and I consider many to be friends. It is only in dealing with a very small minority of lawyers that I am required to make an effort to maintain civility. If a settlement proposal comes in writing, of course we immediately send it out to our client. It is not unusual for our client to call us after reading it, livid with at how outrageous the proposal is and how far it is from what the client perceives as fair. True, some proposals are so low or so high as to be insulting. Some lawyers ask for the stars, hoping to get the moon. Others misinterpret the parameters of reasonable settlement. Whichever is true, at least there has been an attempt at settlement. Rather than get angry if the proposal is in the stars, then start from the ground up. If the proposal is unreasonable because the other side misunderstands the reality of the situation, then educate the other side. But never get angry – any proposal, even a bad one, is better than no proposal at all. Going into settlement negotiations without a prior face-to-face meeting with your client is as wrong as going into trial without such a meeting. Worse, it wastes the time and money of not only your client, but also the lawyer and client on the other side. There are three points of negotiations, two of which need careful preparation. The first is an opening proposal. This should leave some room for negotiation without being out of the ballpark. The second is the optimal position. The client needs to educate the lawyer as to what movement from the opening proposal to the optimal proposal is acceptable. The third point is the “go to hell” point, where litigation is better than accepting the last proposal from the other side. This is a moving target, and although it can be discussed ahead of time, it will be truly known only at the instant the judge bangs the gavel and says “Call the first witness.” It is critical that the family law attorney spend the time with the client getting authority for at least the first two points. If you make a habit out of not being prepared for settlement negotiations, you will earn a poor reputation, and good lawyers will not want to negotiate with you. The degree of preparation the other side put in is usually clear early in the negotiating session. In many settlement conferences, after both sides lay out their positions, there is a palpable pause as both sides hesitate to see who will make the first compromise. If it is clear that other side is not prepared, why would we start to compromise? If they are not prepared to negotiate, they are not prepared to match our compromises. The result is a standoff. The bottom line is to follow the Boy Scout motto: Be Prepared! My joy was boundless. I had learnt the true practice of law. I had learnt to find out the better side of human nature and to enter men’s hearts. I realised that the true function of a lawyer was to unite parties riven asunder. The lesson was so indelibly burnt into me that a large part of my time during the twenty years of my practice as a lawyer was occupied in bringing about private compromises of hundreds of cases. I lost nothing thereby – not even money, certainly not my soul. Note that none of these “commandments” discuss which method of negotiations is preferable. Some lawyers prefer “four- way” meetings, some negotiate only by letters, some draft full settlement agreements first, and still others choose different methods depending on the characteristics of an individual case. And, of course, that are exceptions to each of these commandments. This article originally appeared in GP Solo, published by the ABA General Practice Section.